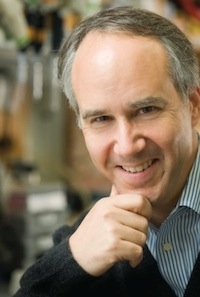 Dan’s laboratory aims to develop a mechanistic understanding of neuropsychiatric diseases, such as autism and neurodegenerative diseases, and their relationship to the range of normal human higher cognitive function and behavior. The lab’s approach relies heavily on computational and bioinformatic methods in addition to wet laboratory experimentation. The ultimate goal is to use these integrative approaches to help develop effective therapeutics for neurologic and psychiatric disorders. Dr. Geschwind has also put considerable effort into fostering large-scale collaborative patient resources for genetic research and data sharing. He is a strong advocate for data and biomaterial sharing, having provided scientific oversight for the Autism Genetic Resource Exchange (AGRE). He has served on numerous scientific advisory boards, including the Faculty of 1000 Medicine, the Executive Committee of the American Neurological Association, the NIMH Advisory Council and the NIH Council of Councils. He has published over 300 papers and serves on the editorial boards of several journals including Biological Psychiatry, Cell, Human Molecular Genetics, Neurobiology of Disease, Neuron and Science.